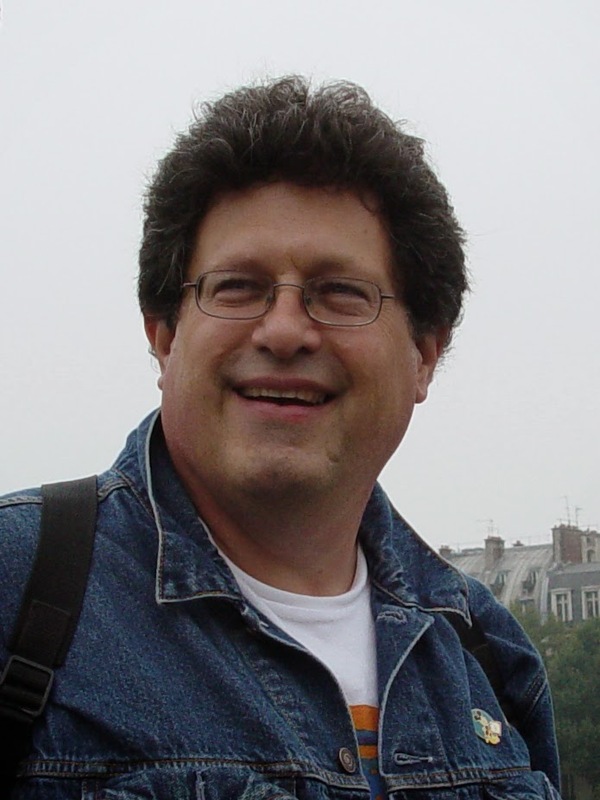 Last week, the international animation community lost one of its greats. Larry Lauria may not have had big-budget movie credits, and he may not have been a household name with the filmgoing public, but he left his mark in bold lines, etched in the minds and hearts of the hundreds and likely thousands of students whom he taught and inspired in his lifetime. In just days following the news of his passing, Facebook spontaneously erupted with a flood of stories, memories, and fond messages of support for his family, streaming in from Ireland, Canada, and all parts of the US. It’s an outpouring of love that leaves no doubt about the impact this wonderful man had on so many. I first heard of Larry at the Savannah College of Art and Design, where he had earned a reputation as one of the toughest if not THE toughest animation professors in the department at the time. Students would sometimes complain about his harsh critiques, but his classes filled up immediately every quarter because everyone couldn’t help but see the fantastic quality of the animation coming out of his students. 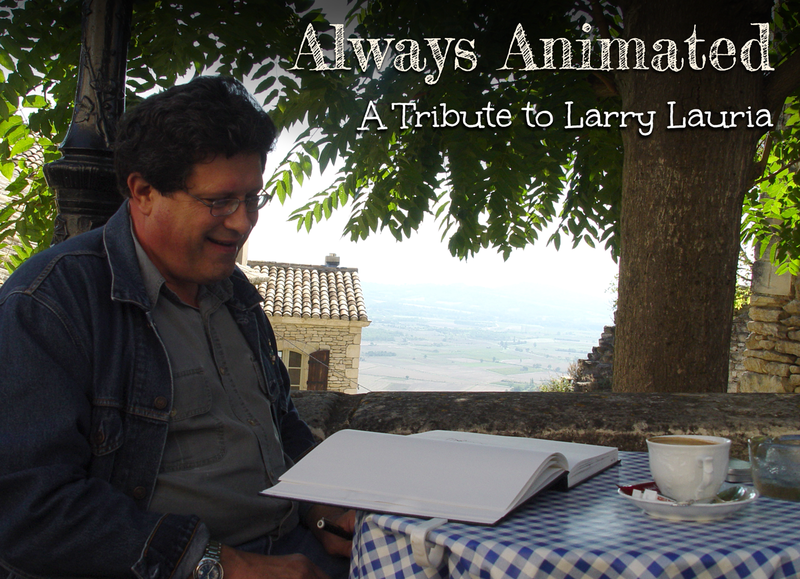 If you were serious about becoming an animator, you made sure you took Larry’s class. 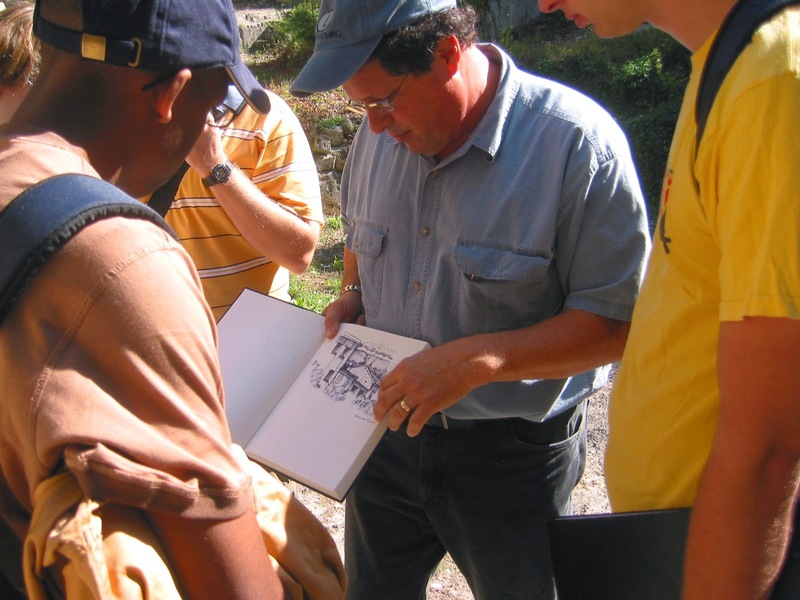 That classical, old-school approach paired with a restless sense of adventure impelled Larry to push for the inclusion of the Animation department in SCAD’s study abroad program, specifically at the French campus in Lacoste, Provence. Along with six others, I jumped at the chance to finally take a class with Larry in the gorgeous, pastoral villages of Southern France. 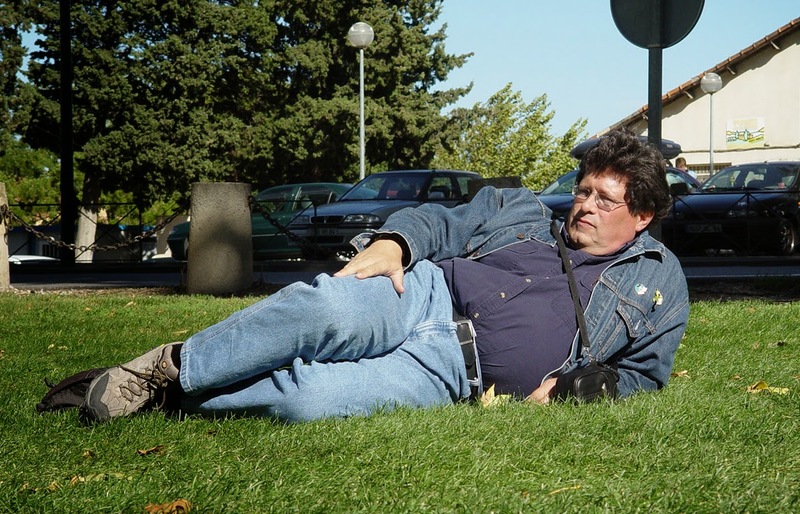 Larry was an extremely seasoned traveler and an admirer of many different arts, so he knew exactly how to take the greatest possible advantage of such a fantastic location. Every day, we visited a new town, sketched the sights, drank an espresso in a cafe, explored Medieval churches, and scoped out farmers’ markets, bakeries, and natural springs. While students of other disciplines spent hours of every gorgeous day in the computer lab or darkroom, Larry made sure that we visited literally every tiny village within driving distance, and many more than once. He gave demonstrations showing how to use ink pen and water brush to sketch a quick impression of a scene, then supplemented our on-location instruction with thorough figure drawing lessons and animation layout exercises. 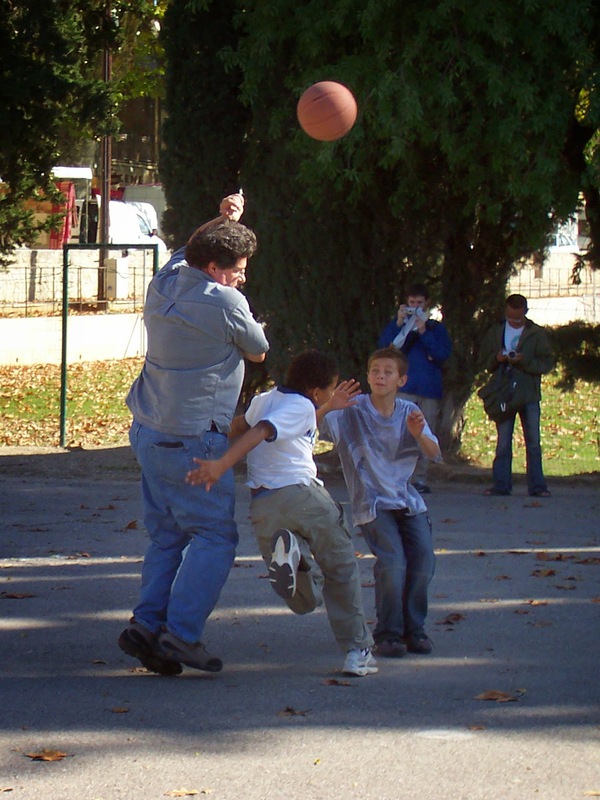 Despite knowing about as little French as the rest of us, he was easily the most engaged with the locals, often joking about how bad our pronunciation was (“Mercy Buccups!”) and one time even joining in an impromptu game of basketball with some village kids. After a few weeks, Larry’s wife Tricia came to visit. At this point in my memory, Larry ceased to be just Larry, and suddenly became Larry-and-Tricia. They were an unmistakable unit, a team, as perfect a match as you’d ever see. It was the kind of romance that everyone envies, with pure adoration clear in every word and expression that either made. Our little group often commented amongst ourselves that Larry and Tricia seemed like a pair of lovestruck teenagers who simply hadn’t noticed that they’d aged. With the rest of our families absent, Larry and Tricia came to form their own little family with the students, inviting us to join them for marathon Scrabble games and lavender ice cream, and showing a sincere interest in all the happenings of our lives. But they didn’t forget their own family! Larry and Tricia, as all parents do, LOVED to talk about their kids. In later years, I’ve had to remind myself on occasion that I’ve never actually met the Lauria children, because I heard so much about them that I feel that I have! They spoke with beaming pride of their beautiful daughters, showing us photos and telling us all about their travels in China or work training horses. Whereas some parents use the term “different” as a euphemism for “Well, one of them is a little crazy,” Larry and Tricia were clearly ecstatic that each of their girls had taken such a unique path for herself and had become successful on her own terms. And then, there was “my baby,” as Tricia called him, and “my son, the actor” as Larry did. Their son’s career had not yet taken off at the time, but it was clear that Larry had not a doubt in his mind that it would. He always seemed particularly proud that his boy had chosen the arts for a vocation, since aside from his family, art was very clearly the center of Larry’s life. Another activity that Larry and Tricia got up to in Lacoste was matchmaking, something I’ve since come to understand they were particularly good at! From that short time in France emerged two couples who went on to marry, myself and hubby being one of them, and that was thanks in no small part to the sneaky encouragement of Larry and Tricia. Larry even gifted us with a little sketch of me and Charlie as little bees (the SCAD mascot), as if to put his stamp of approval on the relationship! After Lacoste and later after graduation, we continued to stay in touch with the Laurias, attending barbeques, calling for career advice, or just generally geeking out about whatever cool animation thing was going on at the time. Larry was quick to put us in touch with other former students of his to help us build our professional network, and we came to learn that he had students quite literally all across the globe and working at most major studios, not to mention dozens of smaller ones. Before the age of social media (Facebook was brand-new and not even available to the general public yet), Larry had kept in contact with what seemed like hundreds of students from decades of teaching, and he often was up-to-date on their lives and careers, remembering details about where they’d moved and when they’d had their own kids. I never heard him speak ill of a student, even those he’d graded harshly in the past. He had faith that every person, with enough hard work, could make a success of himself or herself. Eventually, we moved away from Georgia and so did the Laurias, but we were able to keep touch via Facebook and the occasional phone call. When our son was born last year, Larry commented “Aren’t you glad you went to Provence?” I think he wanted a little bit of credit for the kid’s existence! Over this past Summer, he called to tell us he and Tricia were moving again, and to speculate on the idea of eventually coming out to California. We knew that he was most likely to head toward SoCal where he could be close to his son and the nucleus of the animation industry, but we still plotted ways to convince him to move up to NorCal, instead! Since the news of his untimely passing last week, it’s seemed almost unreal…. I still expect to see a new sketch of Ty-B Bear any day, or hear of another success of his talented kids, or a new adventure he and Tricia are taking. Sadly, Larry has moved on to the next great adventure without the rest of us, but as the stories continue to pour in from all the people who knew and loved him, it’s clear that the impact of his vibrant, compassionate life will continue to be felt for years to come. Thank you, Larry, for the time you gave to us. For others, it’s a cliche, but for you, it’s true: you really did make the world a better place. Resting after a job well done! Godspeed, Larry!